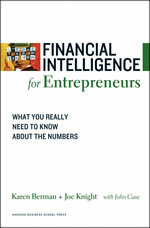 This book is about financial intelligenceabout knowing what the numbers really mean. It is written for entrepreneurs and company owners who need to understand exactly what is happening in their company from a financial perspective. It provides the financial knowledge you need to run your business more effectively. The original edition of this book was called just Financial Intelligence, and it was published by Harvard Business Press in 2006. It was designed primarily for non-financial managers in large corporations. Our company, the Business Literacy Institute (BLI), has taught the basics of finance to many thousands of leaders, managers, and employees in companies around the world. But we noticed a funny thing. Many of our friends and acquaintances entrepreneurs and business owners like ourselvespicked up copies of the book. They told us they found it helpful even though it wasn’t really aimed at them. In some ways, we realized, we have more in common with these entrepreneurs than we do with the corporate managers who are our clients. Karen started BLI by herself, out of her home, right after earning her PhD in organizational psychology. Joe, who holds an MBA in finance, had worked at Ford Motor Company and several smaller businesses; then he joined two other guys named Joe in starting Setpoint, a company that manufactures roller coasters and factory-automation equipment. (At Setpoint, the trio is known as “the Joes.”) Later, Joe joined Karen as co-owner of BLI. We have both met a payroll. We know what it’s like to start and run your own business. So we decided to work with Harvard Business Press to create the book you are holding, an edition of Financial Intelligence specially tailored for entrepreneurs and company owners. Let us tell you a little bit about this edition. First, it contains all the meat of the original book. We have always tried to present financial material so that people who aren’t familiar with the jargon can understand it, and we hope we have accomplished that goal in this book as well. But we didn’t simplify or remove any of the concepts. This is the real stuff. When you have finished this book, you will know what your own company’s income statement is telling youand you will be able to read IBM’s income statement, too. You will be able to talk numbers with bankers, prospective investors, and potential partners. You will be able to understand the financials of a company you may want to acquire, or one that may want to acquire yours. You will have the financial intelligence you need to manage your business as it grows. Second, this book is for all entrepreneurs and company owners who want to build their business. If you’re a financial novice, you won’t find anything in here that is over your head. If you already know the basics of finance, you can use the book to review and refresh your understanding. Perhaps you are a so-called corporate entrepreneur, a manager who suddenly finds himself or herself heading a spin-off venture or a partnership with the parent corporation. If so, you will need to know the language of numbers not only to manage the business but also to communicate with the folks back at headquarters. Or maybe you operate a franchise business. This book will help you analyze your own franchise’s financial performance compared to the performance of others and compared to the parent company's expectations. Third, we’re big believers in hands-on experience. In the back of the book, you’ll find full financial statements for two publicly traded entrepreneurial companies. We have included some exercises that draw on these financials so you can practice working with the numbers. Of course, you can do the exercises using your own company’s reports if you prefer. We hope you won’t just read about finance; we hope you will roll up your sleeves and plunge in. That’s the best way to learn. There are some things we haven’t tried to do in this book. For example, we don’t teach accounting. We never mention debits and credits; we don’t ever refer to the general ledger or trial balances. The book isn’t another version of Accounting for Dummies. Nor will we advise you on how to finance your business, do your taxes, or buy financial software. There are plenty of good guidebooks to these subjects already on the shelves. Our subject is what you need to know about finance to run your business more effectively, and we try to stick to it. Of course, learning about finance can get a little tedious at times. So we often illustrate our points with stories about the many financial frauds and scandals that came to light in the late 1990s and early 2000s. At first these may seem pretty far removed from the day-to-day experience of running a small company, but we left them in this edition for a reason. The principles that govern finance are the same in companies of every size. A big company called Waste Management, for example, at one point increased its profits enormously simply by changing how it depreciated its garbage trucks and other equipment. (We explain how it did that in chapter 6.) An entrepreneur applying for a loan might be tempted to try the same thing. It’s good to be aware of how slippery some of these slopes can be. Besides, it’s always entertaining to read about the bad guys. In preparing this edition of our book, we interviewed a number of entrepreneurs to learn what their experience had been. Among them were Paul Saginaw and Ari Weinzweig, who hail from Ann Arbor, Michigan. Saginaw and Weinzweig founded the famous Zingerman’s Deli because, as they tell it, they couldn’t find a good corned-beef sandwich anywhere in town. They had some experience managing restaurants, but they didn’t have any financial knowledgeSaginaw had been a biology major, while Weinzweig studied Russian history. Saginaw describes what it was like at first: “We didn’t have a problem taking a lot of money in, but in the early going, we had a lot of trouble holding on to the money as it came in. The busier we got, the more money we lost.” Maybe you recognize their plight. If so, this is the book for you. We also spoke with Chip Conley, who started the San Francisco-based Joie de Vivre hotel chain when he was just twenty-six. Conley had a leg up on many entrepreneurs because he had studied finance at Stanford Graduate School of Business. But most of the other company owners he came to know were like Saginaw and Weinzweig: they tried to get by mostly on intuition and gut feel, and they ran into financial difficulties in the process. We recommend building your financial intelligence rather than buying thicker pants. This is an excerpt from Financial Intelligence for Entrepreneurs: What You Really Need to Know About the Numbers by Karen Berman, Joe Knight, and John Case, published by Harvard Business School Press, January 2008. Copyright 2008 Business Literacy Institute. All rights reserved. Since we teach finance for a living, we’ll begin this book in the manner of teachers everywhere: by asking questions. Do you know whether you will have enough cash to make payroll next month? How about the month after that? If you’re running a start-up, do you know your burn ratethat is, how fast you are going through your cash? Do you know how profitable your company’s products or services really are? Do you know that you can be running a profitable business and still run out of cash? If you're thinking about buying a new piece of equipmenta truck, a computer system, a machinedo you know how to figure the likely return on your investment? Many entrepreneurs can’t answer yes to questions like these. The reason is that they haven’t yet acquired the necessary financial intelligence. Note that word: acquired. Financial intelligence, as we use the term, isn’t some innate ability that you either have or don’t have. Granted, some people are better at numbers than others, and a few legendary folks seem to have an intuitive grasp of finance that eludes everybody else. But that’s not what we're talking about here. For most businesspeopleourselves includedfinancial intelligence is simply a set of skills that can be learned. People who work in finance pick up these skills early on and for the rest of their careers are able to talk with one another in a specialized language that can sound like Greek to the uninitiated. Most senior executives of large companies (not all) either come out of finance or learn the skills during their rise to the top, just because it’s tough to run a big business unless you know what the financial folks are saying. But how about you? Nobody gave you an exam in finance when you decided to start a business. You probably didn’t launch your company just so that you could work with numbers. You may have had an accounting class in high school or college, but that isn't enough to prepare you to manage a business. So you may never have had the chance to pick up financial skills. But now is the time. You may be a great salesperson or an inspired engineer. You may be terrific with customers and employees. Your concept for a company is probably fantastic. But if you don’t know finance, you're operating at a disadvantage in the world of business. Fundamentally, financial intelligence boils down to three distinct skill sets. When you finish the book, you should be competent in all of them. Let's look at each one in turn. Not long ago, two acquaintances of ours were running their own business. They loved what they were doing. Their company seemed very successfulin fact, it was doubling its sales every year. The financial reports showed that the company was making money. At one point the entrepreneurs enthusiastically showed these reports to another friend, an experienced businessman, who perused them carefully. We want to make finance as easy as possible. Most finance books make us ﬂip back and forth between the page we're on and the glossary to learn the definition of a word we don't know. By the time we find it and get back to our page, we've lost our train of thought. So here we are going to give you the definitions right where you need them, near the first time we use the word. Frankly, the entrepreneurs didn’t believe him. They wrote him off as a doomsayer. They knew their business was profitable, and they were certain that their hard work could overcome any obstacle. You can probably see where we’re going with this cautionary tale. Sure enough: in just about eighteen months, they called their friend to admit that they were maxed out on their credit cards and on the home-equity loans they had taken out on their houses. They had no more cash and no ability to borrow any more. The business was still booming. But if it was to survive, they would have to sell part of it to outside investors and themselves become minority shareholders. Yet their friend had been able to see the problem coming eighteen months ahead of time, just because he was able to read the financial reportsthe foundation of financial intelligence. Some entrepreneurs think they don’t need to bother with formal financial reports. They run the business out of their checkbook. Or maybe they get a bookkeeper to pay the bills and keep the records they need for taxes, but they don’t really study the reports she prepares. That may be fine for one-person shops. But the minute your company begins to grow, as the owners of that ill-fated business discovered, you can no longer tell how it’s doing financially just by looking at the checkbook. You need to seeand to understandthe information contained in the income statement, the balance sheet, and the cash ﬂow statement. If you ever want a loan, moreover, or if you want to attract outside investors, your prospective lenders and shareholders will expect to see all these reports. And they will expect you to answer detailed questions about the data the reports contain. Entrepreneurs who are financially intelligent understand these basics. They can read an income statement, a balance sheet, and a cash ﬂow statement. They know the difference between profitability and a healthy cash ﬂow. (As our story suggests, understanding cash is particularly important to entrepreneurs.) They understand why the balance sheet balances. The numbers neither scare nor mystify them. We’ll consider the three main financial reports in parts 2, 3, and 4 of the bookand we'll answer questions such as why profit isn't the same as cash. The income statement shows revenues, expenses, and profit for a period of time, such as a month, quarter, or year. It's also called a profit and loss statement, P&L, statement of earnings, or statement of operations. Big companies sometimes throw the word consolidated in front of those phrases, but it's still just an income statement. The bottom line of the income statement is net profit, also known as net income or net earnings. We explain the income statement in part 2. A second aspect of financial intelligence is understanding what might be called the art of finance. In the preface we referred to it as the finance profession’s little secret, but it isn’t really a secret; it’s a widely acknowledged truth that everyone who has studied finance knows. Trouble is, the rest of us tend to forget it. We think that if a number shows up on a financial statement or on your accountants’ reports, it must accurately represent reality. Of course, that can’t always be true, if only because bookkeepers and accountants can’t know everything. They can’t know exactly what everyone in the company does every day, so they don’t know exactly how to allocate costs. They can’t know exactly how long a piece of equipment will last, so they don’t know how much of its original cost to record in any given year. The art of accounting and finance is the art of using limited data to come as close as possible to an accurate description of how well a company is performing. Accounting and finance are not reality; they are a reﬂection of reality, and the accuracy of that reﬂection depends on the ability of bookkeepers, accountants, and finance professionals to make reasonable assumptions and to calculate reasonable estimates. It’s a tough job. Sometimes the accountants and finance folks have to quantify what can’t easily be quantified. Sometimes they have to make difficult judgments about how to categorize a given item. None of these complications necessarily arises because they are trying to cook the books or because they are incompetent. The complications arise because they must make educated guesses relating to the numbers side of the business all day long. The balance sheet reﬂects the assets, liabilities, and owners' equity at a point in time. In other words, it shows, on a specific day, what the company owned, what it owed, and how much it was worth. The balance sheet is called such because it balancesassets always must equal liabilities plus owners’ equity. A financially savvy entrepreneur knows that all the financial statements ultimately ﬂow to the balance sheet. Part 3 takes up the balance sheet. The result of these assumptions and estimates is, typically, a bias in the numbers. Please don’t get the idea that by using the word bias we are impugning anybody’s integrity. (Some of our best friends are accountantsno, reallyand one of us, Joe, actually carries the title CFO on his business card.) Where financial results are concerned, bias means only that the numbers might be skewed in one direction or another. It means only that bookkeepers, accountants, and finance professionals have used certain assumptions and estimates rather than others when they put their reports together. Enabling you to understand this bias, to correct for it where necessary, and even to use it to your company’s advantage is one objective of this book. So financially intelligent entrepreneurs are able to identify where the artful aspects of finance have been applied to the numbers, and they know how applying them differently might lead to different conclusions. They are prepared, when appropriate, to question and challenge the numbers they get from their accountants or finance folks. In the following chapter we’ll show you some specific examples of the art of finance, but it’s a lesson you'll want to bear in mind throughout the book. Once you can read the financials, and once you have an appreciation of the art of finance, you can use the information to analyze the numbers in greater depth and to make decisions based on what you learn. For example, did you know the following? A couple of simple ratios derived from the balance sheet will tell you at a glance whether you're going to be able to pay your bills during the coming year. If you can’t pay your bills, you may decide to apply for a loan. These are the same ratios bankers will use to make an initial judgment about whether they should consider your company creditworthy. Profitability ratiosderived from the income statementhelp you understand how much money your company is making. If your goal is to maximize profits, you want these ratios to be as high as possible. But there’s one profitability ratio that can be too high. If it’s higher than your competitors’, or higher than industry averages, it may be a sign that you are failing to manage your business as well as you could. Efficiency ratios, as they are known, tell you how well you are managing the assets that you are putting to work in your company. Once you understand these ratios, you will know how to improve your company’s profits and cash ﬂow without any change in sales or costs. Financially intelligent entrepreneurs learn to understand and analyze many such ratios. They use their analyses to inform their decisions, and they make better decisions for doing so. Over time, they watch trends in the critical ratios to make sure they’re on the right track. That skill, by the way, is one key to the story about the entrepreneurs who ran out of cash. The entrepreneurs’ friend could see from the trend line in a couple of critical ratios that the business would run out of cash in about eighteen months. Financially intelligent entrepreneurs also know how to do return-on-investment (ROI) calculations. Before they buy a new truck, computer, or piece of machinery, they analyze the numbers to see whether the purchase is worth it. We'll take up ratios and ROI in parts 5 and 6 of this book, and we’ll have more to say on that business of improving your profits and cash ﬂow without changing sales or costs in part 7. Cash means the money a company has in the bank, plus anything else (like stocks and bonds) that can readily be turned into cash. Really, it is that simple. The cash ﬂow statement shows cash coming in, cash going out, and the difference between them. We'll talk about cash and describe the cash ﬂow statement in part 4. So those are the key elements of financial intelligence and the key elements of what you will learn in the book. These elements are what you need to know about finance. Familiarize yourself with them, and you will be a bettera financially intelligentbusinessperson. We have worked with enough people and companies to know that while everyone might want to increase his or her financial intelligence, it isn’t always easy. In fact, we run into several predictable obstacles. One obstacle might be that you hate math, fear math, and don't want to do math. You started a companyor you’re thinking about starting onebecause you had a new idea or because you wanted to be your own boss. You aren’t necessarily a fan of numbers. Well, join the club. It might surprise you to know that, for the most part, finance involves addition and subtraction. When finance people get really fancy, they multiply and divide. You will never have to take the second derivative of a function or determine the area under a curve (sorry, engineers). So have no fear: the math is easy, and calculators are cheap. You don’t need to be a rocket scientist to be financially intelligent. A second possible obstacle is your feeling that, on some level, profit isn’t your real objective. Perhaps your primary goal is to satisfy customers, help support your community, or provide incredible service. We have two responses to this concern. One is that if you don’t make a profit, you won’t have a business at all. Profit gives you the resources you need to keep the business going day to day (and year to year). Profit helps you finance growth. Profit ensures that your business continues so that you can keep on satisfying customers, supporting your community, and providing incredible service. (If you are running a nonprofit, the same concept applies: even nonprofits need to have funds left over after they pay all the bills.) Our second response is simply to note that you are the owner or one of the owners of this business. You’ve probably invested your own money in it. You could have invested in something else, and you would probably have earned some sort of return on your investment. So you should expect that, eventually, you'll get a return on the money that you put into this investment. That return comes when the company makes a profit. A third possibility is that you’re afraid of appearing ignorant. You want your accountant, banker, and other financial advisers to think that you understand everything they tell you, even when you don’t. Well, reading this book will enable you to ask intelligent questions and to decipher their answers. Asking questions, as PBS Kids tells our children, is a good way to find things out. A fourth possibility: you don’t have time. Just give us enough time to read the book. If you ﬂy for business, take it with you on a trip or two. In just a few hours, you will become a lot more knowledgeable about finance than you have ever been in the past. Alternatively, keep it somewhere handy. The chapters are deliberately short, and you can read one whenever you have a few spare moments. What could be more fun than reading a bit about the balance sheet on the beach during your next vacation? If you can overcome these obstacles, you will have a healthy appreciation of the art of finance, and you will increase your financial intelligence. You won’t magically acquire an MBA in finance, but you will be an appreciative consumer of the numbers, someone who’s capable of understanding and assessing what the financial reports are saying and asking appropriate questions about them. The numbers will no longer scare you. One final caution before we move on. Although we teach finance, and although we think that every entrepreneur should understand the numbers side of his or her business, we are equally firm in our belief that numbers can’t and don’t tell the whole story. A business’s financial results must always be understood in contextthat is, within the framework of the big picture. Factors such as the economy, the competitive environment, regulations, changing customer needs and expectations, and new technologies all affect how you should interpret the numbers and what decisions you should make. Numbers should inform your decisions, not determine what you decide.